2019 Rates: $130-$225 peak season. A queen size antique white iron bed with brass accents. Room has a view down toward Sawyer Harbor. Has a gas fireplace, loveseat, cable TV, CD player, small refrig. A private bath down the hall and has a claw foot tub with shower. $110-130. A cozy room on first floor with a soothing yellow and green decor complete with an antique black iron queen size bed with gold accents, lady slippers stenciled as a border on the walls, the original hardwood floor. 6 foot double whirlpool for 2 with shower. Cable TV, CD player, sm. Refrig. $120-140. As the name suggests, the decor is a delightful green and white with an antique four poster queen size mahogany bed, gas fireplace, flat screen cable TV, CD player, sm. Refrig. 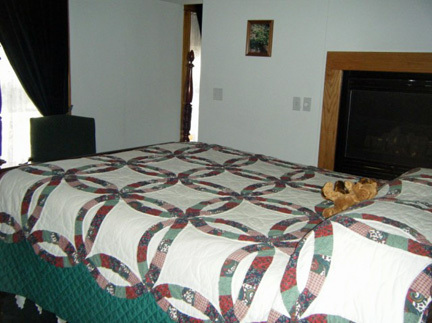 Soft carpeting, 6 ft. double whirlpool for 2 with shower in alcove of bedroom. View the beauty of the outdoors and relax. $120-140. The Wild Rose Room was made for lovers on their first night together or enjoying a lifetime together. Indulge yourself, light candles, play music on the CD player, enjoy a bottle of wine in front of the gas fireplace or in the 6ft double whirlpool made for 2. 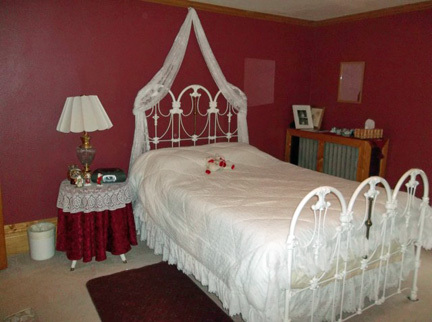 Room has a full-size couch also to relax on, the color scheme is white and red, and roses are stenciled above the windows, and blend with the rose theme in the room. Cable TV, CD player, small refrig. Attached large bathroom has the whirlpool and separate shower, pedestal sink. $130-150. This is the full third floor of house, with wonderful views of the water for miles in 2 directions. Large L shaped living area, with one sitting area to watch cable TV or listen to music and relax or the other area in front of the gas fireplace and large window to relax and enjoy the view. Has the Door County Lighthouses painted on the walls by a local artist. 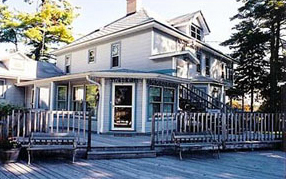 Has 2 separate bedrooms both with queen size beds and small sitting areas and Cd players; one has a water view and the other view is side yard, gardens and deck. Large bathroom with a 6 ft. double whirlpool made for 2 with skylight over and shower, pedestal sink. 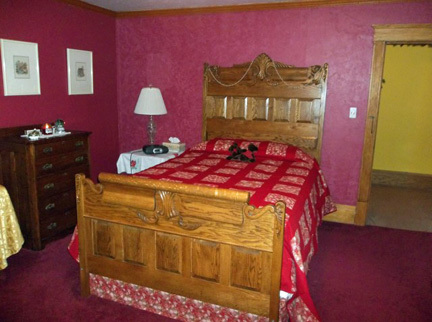 Come and enjoy this unique suite and Door County. $185-200. Specials always available please see website www.sawyerhousebb.com for specials. Open year round. Has free wireless internet, AC. For everyone’s comfort we request that there is no smoking inside the building, smoking is permitted outside on front porch or deck. No pets permitted. Check in time is 4-7 p.m. (earlier or later by special arrangement). To confirm a reservation we request deposit equal to one night lodging. Cancellation policy. If reservation is cancelled before 14 days of date reserved a full refund is given. Within 14 days of reservation if room is able to be re-rented just a $15 processing fee will be charged, if room not re-rented, the one night stay will be charged. Breakfast is served in the dining room at 9 a.m. Breakfast may include: egg dishes, baked French toast, stratas, pancakes, muffins, fruit, jams and jellies, juice, coffee and tea. All items are homemade from scratch. Sweets are out in the afternoon and evening and may be: cookies, cakes, brownies, or pies. Special diets can be accommodated with advance notice. We also have 2 large sitting areas on first floor quests are welcome to use. A large deck to relax on or front porch. Come and enjoy Door County.